Editor's Note: Below is a brief excerpt from today's edition of Market Edges, our weekly newsletter of big picture Macro investing insights. Click here to learn more about Market Edges. Most of Wall Street remains glued to US/China Trade War headlines. The mainstream media is fixated on the U.S. government shutdown. 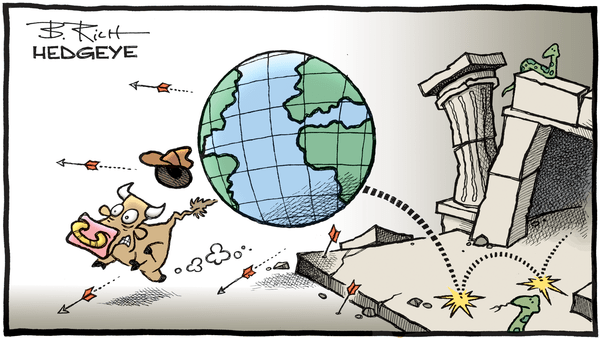 Meanwhile, each and every passing day, the economic data (i.e. reality) is reported. Our team's proprietary Macro process is built upon the bedrock of measuring and mapping this economic data daily. Instead of getting whipped around by the latest Macro Tourist headlines, we want to get you in front of the BIG macro trends that drive markets over the next 3 to 6 months. Right now, that means keeping you proactively prepared for Quad 4 (U.S. Growth and Inflation slowing) and the asset allocation outperformers therein. 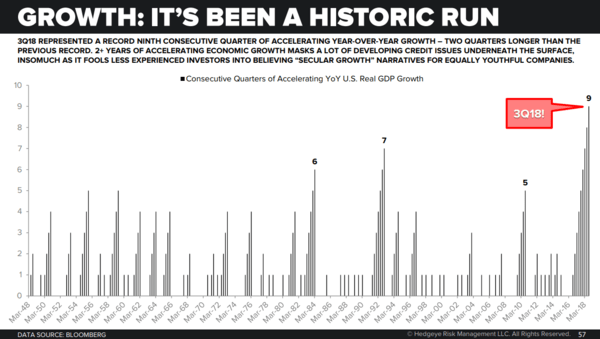 The U.S. economy has accelerated 9 straight quarters. If you're keeping score, that historic run is two quarters longer than the previous record of 7 straight quarters of year-over-year GDP accelerating. Two plus years of accelerating economic growth masks a lot of developing credit issues underneath the surface. It also fools less experienced investors into believing secular growth narratives for equally youthful companies.